Northwest Seaport Alliance objected to the bankruptcy sale of Hanjin Seattle terminal. Hanjin lease on Seattle's Terminal 46 lasts until 2025. Northwest Seaport Alliance is in conversations to resolve terminal lease issue amicably. As a deadline for filing in a U.S. bankruptcy court neared last week, the Northwest Seaport Alliance (NWSA) objected to the sale of the Hanjin terminal in the port of Seattle to the Luxembourg-based Terminal Investment Limited. At issue is whether TIL, which, together with Mediterranean Shipping Company, offered $78 million for a majority stake in the terminal, has to fork over an $11-million security deposit for the Hanjin lease on Terminal 46 that lasts until 2025. The Northwest Seaport Alliance operates both the Seattle and Tacoma ports. Hanjin filed for bankruptcy on August 31 in a South Korean court and is currently is in the process of liquidating its assets. As case was also filed in the United States Bankruptcy Court for the Distict of New Jersey under Chapter 15 of the Bankruptcy Code, which is designed to protect the interests of U.S. parties in a foreign bankruptcy. 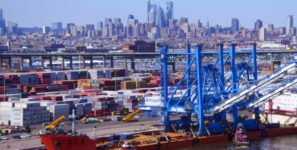 “The Northwest Seaport Alliance is objecting to the recent proposal for the sale of Hanjin’s interest in Total Terminals International that is now awaiting approval by the New Jersey Bankruptcy Court,” NWSA spokesperson Tara Mattina told Global Trade Daily. “We take this action in order to ensure the interests of the NWSA, under its lease with TTI, are adequately protected in the form of surety of lease payments. Our action is consistent with one of the purposes of Chapter 15 of the Bankruptcy Code. NWSA is in conversations with its customer to resolve the issue amicably, Mattina added, in which case the objection could be removed. According to court records, Terminal Investment took the position that it is not required to put up the security deposit. A hearing on the issue is scheduled for tomorrow.